A music-obsessed getaway driver named Baby looks for a way to get out of the criminal lifestyle so he can run away with a waitress from the local diner. Baby's boss, however, forces him to keep working. FINALLY, A GOOD MOVIE THIS SUMMER!!! "Baby Driver" is written and directed by Edgar Wright, who is known for films like "Shaun of the Dead," "Hot Fuzz," and "Scott Pilgrim vs. The World." It stars Ansel Elgort as Baby, a too cool, music-loving, tinnitus-having getaway driver who works for a criminal mastermind named Doc, played by the always brilliant Kevin Spacey. Doc plans and bankrolls a series of heists with various different unsavory characters doing the dirty work. 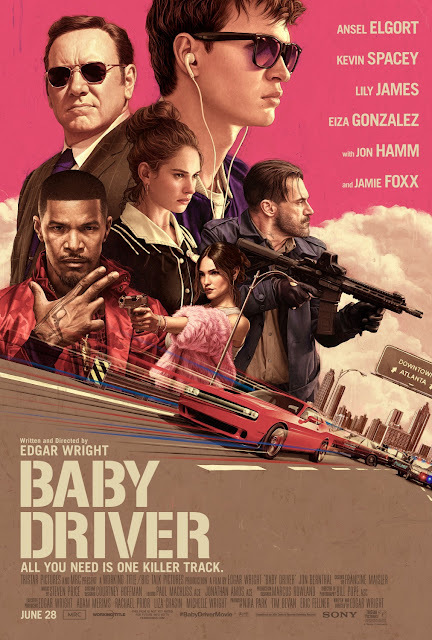 These criminals are played by the likes of Jon Hamm, Eiza González, Jamie Foxx, Jon Bernthal, Flea, and Lanny Joon, and Baby has always been the driver for these jobs. He has wanted out of the biz for while, but he has a debt he must to repay to Doc first. Once he pays off this debt, Baby is ready to bail and hit the road alongside Debora, played by Lily James, a waitress working at the diner he frequents, who also has a fascination with music. Edgar Wright always offers an amazing visual smorgasbord and stylish aesthetic in his movies, and "Baby Driver" is no exception. In fact, it may go above and beyond anything he has done in the past. The moment the opening scene begins, audience goers will know they are in for a bright, colorful, soulful, auditory treat. As Baby walks his way to a local coffee shop to the tune of "Harlem Shuffle" by Bob & Earl, the city of Atlanta comes alive as the lyrics of the songs appear on graffitied walls, street signs, the trucks of workers, the t-shirts of passersby, all as Baby suavely struts to the rhythm of the music, always with his sunglasses on. From that moment, we were hooked. Edgar Wright's wheelhouse has always been comedy laced with action. "Baby Driver," however, is more of an action crime film with comedy riding in the back seat. The humor is definitely here, but it is mostly the amazing car chases and shootouts that are driving this entire shebang. Once again, from the moment the film starts, the opening chase shows us what we're in for. It's absolutely amazing, full of some crazy yet very realistic driving stunts. Everything that happens in this flick when Baby is behind the wheel brings endless amounts of excitement, fun, and heart-pumping good times. As a character, Baby is extremely likable and charismatic, though in a much more stoic manner. He is one of the most capable people in the room at all times, but he's also the quietest. He knows he has what it takes to do his job and won't let anything get in his way...until it does. Ansel Elgort gives a great performance here. He has been good in other movies, but we think this might be the role that changes the course of his career. Really well done. Other cast highlights include Jamie Foxx, who has quite a few tremendous, funny moments as the unhinged Bats. This is one of his best performances in a long, long time. As we mentioned above, Kevin Spacey is, as always, capable, commanding, raw, and frank. Lily James also delivers a good performance, and she and Elgort have excellent chemistry with one another. However, the best part in the entire movie goes to the music. Dear god, this soundtrack and the way Wright incorporates it into his film with absolute precision is nothing short of brilliant. Killer tunes for a killer movie. "Baby Driver" is a thrilling, vivid, euphonious, sophisticated blast of energy in a world overstuffed with underwhelming, bloated, pointless cookie-cutter flicks. It provides the audience with a visceral, immersive movie watching experience we won't soon forget. It's a fun ride with interesting characters that may fit into general archetypes, but are still amazing in their own way. We like that this movie boasts a series of heists, but whenever they occur, they always happen in the background as Baby waits in the car for the criminals with the guns to get back. After a few weeks of disappointing action movies and big blockbuster stinkers, do yourself a favor a check out this wonderful film that proves studios don't need to shell out hundreds of millions of dollars to make a riveting and rousing movie going experience. PLEASE SUPPORT MOVIES LIKE THIS ONE, especially ones that are so utterly fantastic!! !